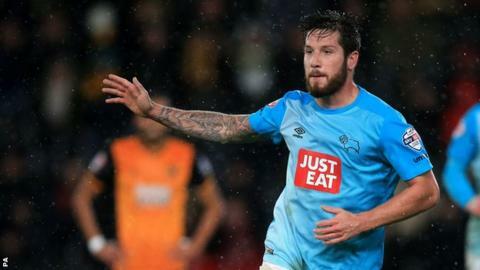 Derby County moved to the top of the Championship as two first-half goals from Jacob Butterfield saw off previous leaders Hull City at the KC Stadium. Butterfield fired in a loose ball from 12 yards to put the Rams ahead and the midfielder doubled their lead with a volley from the edge of the area. Hull's first loss at home this term was also their first in 12 league games. Derby are a point clear of Hull and third-placed Brighton, who host Birmingham on Saturday. The visitors were worthy winners against a disjointed Hull, who were missing injured captain Michael Dawson and suspended left-back Andrew Robertson. Paul Clement's side were always dangerous on the counter attack and fully deserved their two-goal lead at half-time, with Cyrus Christie and George Thorne both going close before Butterfield's brace. Right-back Christie's marauding run into the penalty area was halted by Hull defender Harry Maguire, while goalkeeper Allan McGregor kept out Thorne's long-range attempt. Rams keeper Scott Carson made smart saves to deny Hull duo Tom Huddlestone and Abel Hernandez before the interval, while Shaun Maloney - whose equaliser earned a draw at Bristol City six days earlier - worked a superb chance for himself after an hour but poked his shot wide. Sam Clucas turned another close-range opportunity over the bar as Hull failed to score for only the second time this season, and Derby could have stretched their lead further in the closing stages but Thomas Ince curled his first-time shot off target against his former club. "In the first 20-25 minutes we've probably made more mistakes defensively than we have all season and I think that was the difference. "We've made big errors, given the ball away cheaply and I have to take responsibility too with the way I set us up to start with. "Maybe it was too many changes with the absentees that we've had. However, in the second half when we changed it a bit, we needed to get that goal and we've had enough opportunities. We haven't quite managed to take one." "It's a really pleasing victory. They're a good side, they put us under pressure and they had some really good chances - but we can be really happy. "The goals came at really good moments and that gave us that cushion and that ability to make sure we were defending resiliently and picking them off on counter-attacks. "Our best football was in the first half but overall the defending of the team was excellent. "For the first time this season we're at the top of the table." Match ends, Hull City 0, Derby County 2. Second Half ends, Hull City 0, Derby County 2. Attempt missed. Harry Maguire (Hull City) header from the left side of the six yard box misses to the left. Assisted by Sone Aluko with a cross following a corner. Corner, Hull City. Conceded by Jason Shackell. Attempt blocked. Sone Aluko (Hull City) left footed shot from outside the box is blocked. Assisted by Abel Hernández. Attempt missed. Harry Maguire (Hull City) right footed shot from outside the box is close, but misses to the right. Assisted by Jake Livermore. Attempt missed. Sam Clucas (Hull City) left footed shot from the centre of the box misses to the right. Assisted by Harry Maguire following a corner. Attempt missed. Harry Maguire (Hull City) header from the centre of the box misses to the left. Assisted by Shaun Maloney with a cross following a corner. Corner, Hull City. Conceded by Craig Bryson. Attempt missed. Tom Ince (Derby County) left footed shot from outside the box misses to the left. Assisted by Chris Martin. Attempt missed. Abel Hernández (Hull City) left footed shot from outside the box is high and wide to the left. Assisted by Tom Huddlestone. Substitution, Hull City. Isaac Hayden replaces Mohamed Diamé. Substitution, Derby County. Johnny Russell replaces Andreas Weimann. Attempt blocked. Mohamed Diamé (Hull City) left footed shot from outside the box is blocked. Assisted by Chuba Akpom. Shaun Maloney (Hull City) wins a free kick on the left wing. Substitution, Hull City. Chuba Akpom replaces Moses Odubajo. Substitution, Hull City. Sone Aluko replaces Curtis Davies. Cyrus Christie (Derby County) wins a free kick in the defensive half. Attempt blocked. Harry Maguire (Hull City) right footed shot from the centre of the box is blocked. Assisted by Tom Huddlestone with a cross. Corner, Hull City. Conceded by George Thorne. Attempt blocked. Abel Hernández (Hull City) left footed shot from the left side of the box is blocked. Assisted by Mohamed Diamé with a through ball. Attempt missed. Shaun Maloney (Hull City) right footed shot from the right side of the box is too high. Offside, Derby County. Tom Ince tries a through ball, but Chris Martin is caught offside. Attempt missed. Shaun Maloney (Hull City) right footed shot from the centre of the box is close, but misses to the right. Assisted by Abel Hernández. Attempt blocked. Tom Ince (Derby County) left footed shot from the right side of the box is blocked. Assisted by Jeff Hendrick. Attempt blocked. Jake Livermore (Hull City) right footed shot from outside the box is blocked. Corner, Derby County. Conceded by Sam Clucas. Attempt blocked. Jacob Butterfield (Derby County) right footed shot from outside the box is blocked.